Well it looks like Age of Sigmar is getting some love on the cover at least. Aside from that, the side panel has some of the features listed and some are obscured by the price tag at the bottom left corner. While it does have some interesting stories listed, it unclear if there will be anything as “game changing” as the additional rules for the Crimson Fists. Glory points could be interesting and I always welcome the painting and modelling guides. Plus there appears to be some more details about a” New Skirmish Campaign” for AoS, too. One contender could be “The Tome Celestial: The Hammerhands” section. Perhaps that’s a new feature that will introduce some more optional rules for the Hammerhands of the Stormcast Eternals. The “Fantastical Realms” section could be another area where GW expanded the rules as well. They did add lots of new rules for the different realms to fight over, perhaps this edition of the White Dwarf has an expansion to those rules. What else do you think we’re going to see in the White Dwarf? 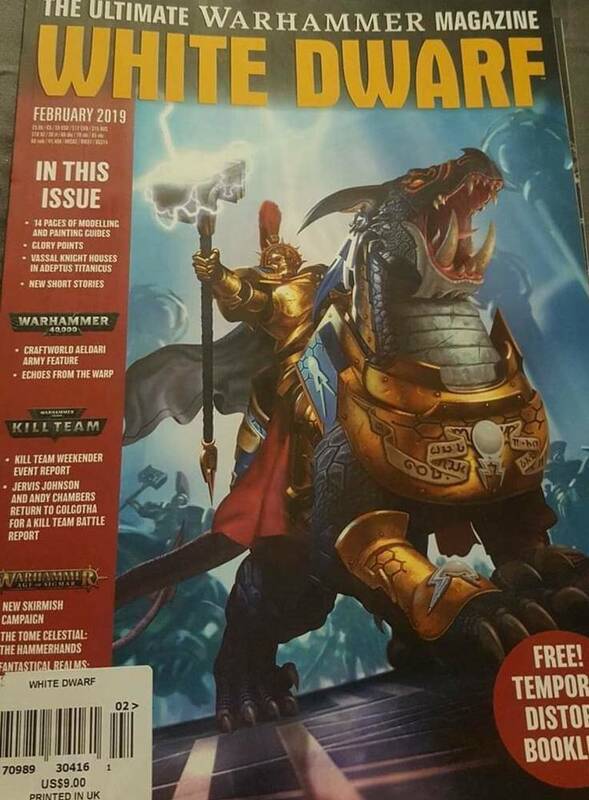 Extra rules in this issue or did GW skip over February?